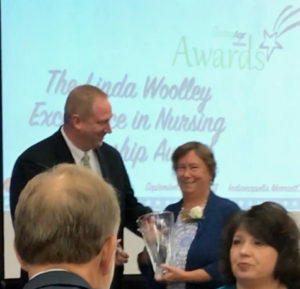 Each year, LeadingAge Indiana recognizes a nursing professional who demonstrates good mentoring relationships, and enables others to act proactively in the care of residents with the Linda Woolley Excellence in Nursing Leadership Award. 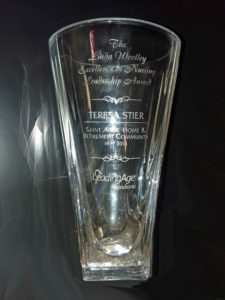 This year’s winner is Teresa Stier, long-time employee of Saint Anne Communities. Teresa started at Saint Anne Communities, then Saint Anne Home, fresh out of nursing school in March of 1980 as a floor nurse. Although teaching had always been her passion, Teresa felt called to follow in the footsteps of a couple Aunts and pursue nursing instead. Being a Catholic, Teresa decided Saint Anne’s seemed the ideal place to start out. In her 38.5 years as an employee of Saint Anne Communities (so far), Teresa has held many positions such as floor nurse, charge nurse in the nursing home, charge nurse in the assisted living apartments, Quality Assurance nurse and nursing scheduler. Her current management role includes MDS nurse, scheduler, and restorative nurse. Through her positive attitude, sincere love for people, and natural teaching talent, Teresa has touched the lives of every Saint Anne nurse and CNA. Teresa has always been the “go to” person for nursing staff and non-clinical staff, as well. Colleagues from every department are comfortable approaching her with questions or concerns because they know she will listen and help. 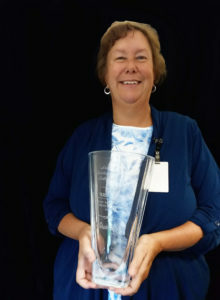 Teresa is a wonderful example of “Excellence in Nursing Leadership,” and well-deserving of the Linda Woolley Award. 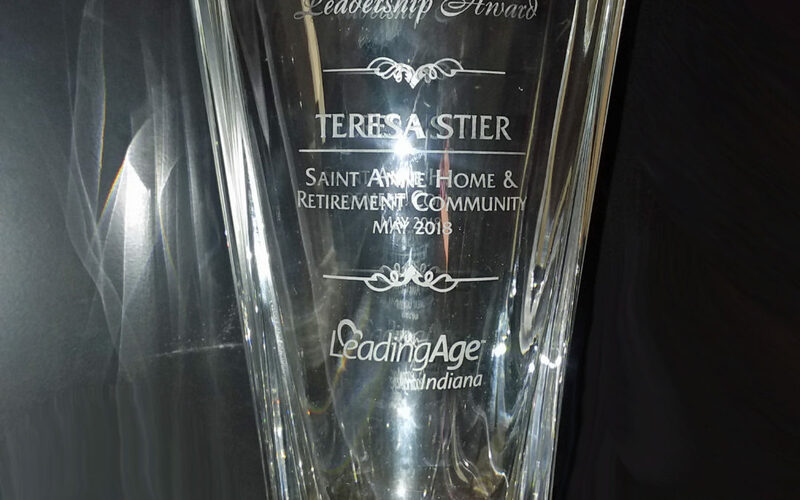 The team at Saint Anne Communities is so proud of Teresa!